"This is a national problem requiring national leadership," Mayor Michael Bloomberg said. 48 NYC shootings in a weekend: Trend or random tragedy? It was a very bloody Labor Day weekend in New York. Forty-eight people were shot, including two law enforcement officers and a woman who was sitting with her daughter on a Brooklyn building stoop. The officers survived; three people have died. The high number of shootings has captured headlines and led some to wonder whether there's some specific explanation for the violence. Mayor Michael Bloomberg says there is, and he said Tuesday that lawmakers in the nation's capital ought to do something to better control gun violence. New York state reportedly had some of the strictest gun laws in the country, but Bloomberg wants Washington's help. He spoke outside a hospital where the officers were being treated. "This is a national problem requiring national leadership," he said, according to the Los Angeles Times. "But at the moment, neither end of Pennsylvania Avenue has the courage to take basic steps that would save lives." Jon M. Shane, an assistant professor at one of America's most highly regarded policing think tanks, the John Jay College of Criminal Justice in New York, cautioned against drawing any conclusions from the numbers alone. Shane spent 20 years with the police department in Newark, New Jersey, which has consistently ranked as one of the most violent cities in the United States. "I would caution against chalking this up to violence that is going to happen over any holiday weekend," Shane said, adding that thorough analysis of each Labor Day weekend shooting should be done to extrapolate concrete explanations that go beyond the particulars of each incident. One would need to research possible motives in each case and investigate suspects' backgrounds and their possible criminal affiliations. Previous crimes at the locations should be weighed from every angle. In short, 48 shootings sounds like a lot, but drawing any large conclusions, or linking them to a larger trend, will take time. The woman and the officers were shot Monday hours after the West Indian American Day Parade ended in Crown Heights, Brooklyn. According to the New York Post, two men were "slap boxing" before a shootout in which police became involved. In all, nine people in the area of the parade were shot. 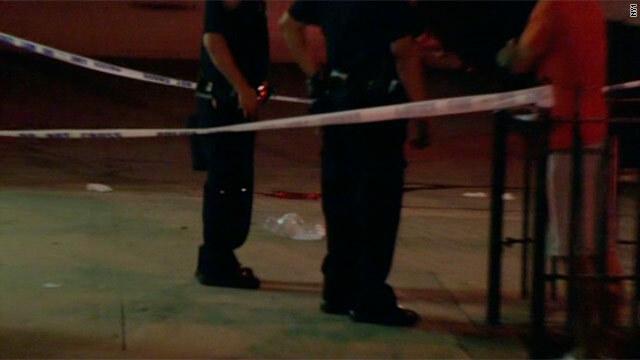 Several people were shot in the Bronx on Sunday. Some of the wounded were children. Four people were shot Monday in Flatbush, Brooklyn, one teenager fatally. The weekend's bloodshed put a fine point on figures the FBI released in May showing that violent crime was down throughout the country in the past year but up in New York. The New York Police Department released its own report in January, available in full here (PDF), which visually lays out all of the city's 536 homicides in 2010. Occam's razor. It's because NYC is a craphole, just like Atlanta, Nashville, Miami, New Orleans, etc. How's that Sullivan Act working out? Seems to me that only criminals have the right to own guns in NYC because they take that right, law or not. An international criminal network has control over America. This net work has moved into the city/county manager system. Actually, these appointed political racketeers have tie ins a cross America. Actually, this method of managers are small time dictators. One might add that the ties between building inspectors and managers holds any city or county at bay. In essence, American is in the hands of an universal master criminal complex. This syndicate has ulterior motives other than milking honorable tax payers at the hands of ruthless tax collectors, building inspectors, and those of of whom labor as one-eyed- jacks in the field of political gangsterism. "New York state reportedly had some of the strictest gun laws in the country"
"The weekend's bloodshed put a fine point on figures the FBI released in May showing that violent crime was down throughout the country in the past year but up in New York." Don't get rid of guns, get rid the ACLU and we might get rid of a lot of criminals. With the influx of immigrants and the out of control illegals who flood to NY for the American dream, how is it a surprise that these shootings occur? What kind of lawlessness exists in third world countries compared to the US? Do you not think Mexicans have as much a perpensity for violence as say...someone from Somalia? If you are raised in a lawless society, what makes you think that simply because you change your locale that all of a sudden you become law abiding? NY gun laws do not go far enough. We need a mandatory 5 year sentence for anyone caught carrying an unlicensed firearm...not just 1 year. If we need to build more prisons then so be it. If we need to hire more law enforcement officers...so be it. Until you are serious about fighting crime with real actions as well as serious punishment...then this headline will simply keep repeating itself...maybe not in NY...but in a city where you live. The problem is that until your son, daughter, husband , or wife is killed by a stray bullet...then you could care less. The odds are against you for being complacent. I'm not giving into this bull. You want my guns? First I'll give you my bullets, one by one, and the ground can keep the casings. Then you can unclasp my bloody hand from my gun and take it. DO YOU THINK I'M KIDDING? I would take down people with me. NO DOUBT. I think to get guns off the streets and out of these monkeys hands whom need to proof what ? Bunch of immature elements who are steel attached to their mother umbilical cord. the MAFIA should be commissioned to take care of these thugs!!! Was Jim Crow really such a bad idea? Jim Crow laws were started for the very purpose of protecting polite society from black violence. Today, multiple urban areas have been completely ruined by blacks, whites are fleeing, and there is no solution in sight. Yet, all I hear is how diversity is such a great thing – how can any reasonable person still believe that? We need to shut down gun sales outside of legitimate stores. Gun shows and the loopholes they have created part of this problem. And nobody needs a God#@%# AK-47 to hunt. Spare me. The right to bear arms includes the responsibility to safeguard them and register them. Increase penalties for illeagally selling guns – I mean serious prison time. The gun manufacturers should be leading the charge-but like the oil companies they just sit back and count their money.. The bigger the population the bigger the chance of there being a shooting. It's in the percentages. Should have never invented guns if you didn't want shootings to happen. But if you take guns out of the equation, other weapons will be used in their stead. People by nature can and some will commit violence. Last time I checked we are still mammals; animals roaming the Earth.